We all have different types of jobs, so even the type of shoes we wear to work will depend on the type of work we do and the conditions from which we work from. A person who spends most of their time doing office white collar work wears different work shoes from a person who spends most of their time in the field or rough working conditions like factories or garages. So, on this list, you will find different work shoes and I have catered for both office people and field work people. What ever your career is, you should always be smart, portray your self in a re-presentable manner by opting for trendy styles. Many times I see men working in factories minding less when it comes to their style. I know you spend most of your time dealing with machines, but after work, you will have a chance of interacting with the rest of the society, so it is better to dress in appropriate manner, never know, you might land on a great opportunity which will change your life forever, but the person to grant you that opportunity will judge you basing on how you look. 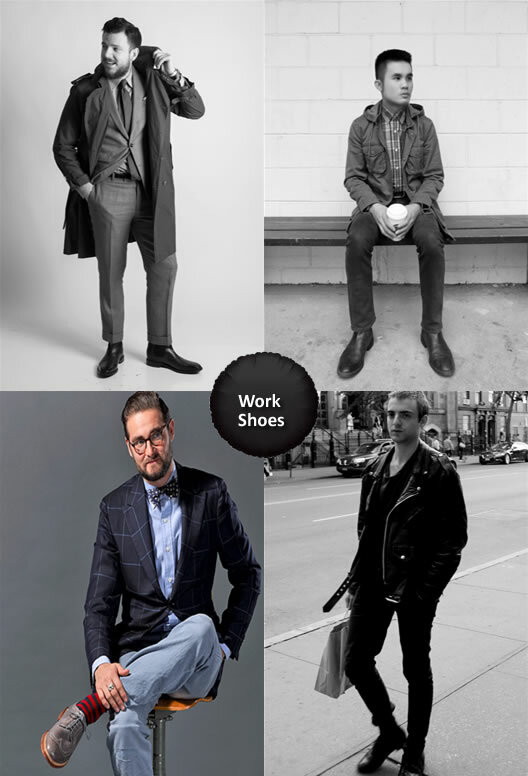 Today in Olixe, I have compiled a list of the best work shoes for men. My test for work shoes might differ from your test, but I’m sure that you will at least find a great pair for your career on this list. 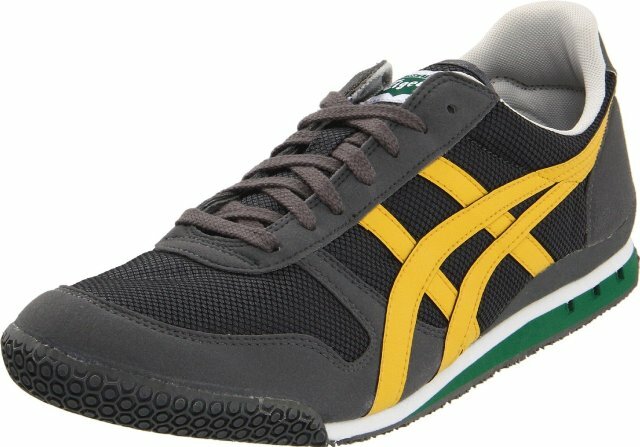 NOTE: Links to stores where you can buy these Work Shoes for Men are listed at the end of this post. Just like I said, the type or work we all do is different, men who deal with factory related work or outdoor type of work, you will find these mile boots very essential. The boots have a cool design which makes them trendy, so you will not look like that lousy factory guy who never cares what they wear. It features lace-up style, leather sole, leather upper and rubber sole for durability. So, what can you wear with the Mile Boot Work Shoe? Tip 1: If this is your option, it means your work is not office related, so you cab wear them with jeans. Since you do casual type of work, I suggest you opt for a t-shirt and a denim jacket. Remember to complement the boots with a brown leather belt, you can as well tuck in the jeans with these boots and look more stylish. This is a great work boot for the casual guy who loves what he does and wants to show his passion through fashion. This is a classy Wingtip boot which you can wear to work with jeans. The boot comes on various colors and these include black, brown-black, black/Tan , brown, brown/tan. So you will have a wide option on which color to opt for. Most men love black & brown boots because it’s very easy to style them. This Addison’ Wingtip Boot features lace-up front, round protective toe to provide extra protection to your toes while at work, leather upper and leather sole which guarantee durability and quality. What to wear with this black/tan wingtip boot for work? Tip 1: Without any doubt, this boot will match with jeans, it doesn’t matter the style of the jeans, could be a simple fade, distressed jean, relaxed leg jeans, skinny jeans and so much more. You can complement your trend with a v-neck t-shirt and a leather biker jacket. Since the boots have both black & tan, you can match them with a black or tan brown leather belt. Now, it is time for the office guy, who always wants to look stylish while at work. Formal careers will require you to wear trends like suits or trousers, so your bound to opt for oxford career shoes like this Adrian’ brown Oxford shoe. You can team this formal work shoe with navy blue, black or gray suits. Tan brown looks good on those three colors, but remember to complement the shoe with a tan brown leather belt. 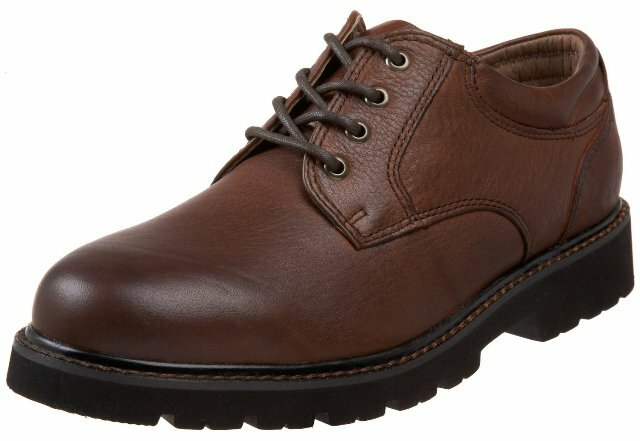 Example of how you can wear this brown oxford shoe? Tip 1: Wear a slim fit navy blue suit with a white dress shirt, then match the suit with this tan brown oxford shoe, complement the shoes with a tan brown classic leather belt and accessorize with a slim blue tie. Many men prefer single button suits, but also a two button double breast slim-fit suit will look good on you. If you decide to wear trousers with these shoes, I suggest that you go for flat front trousers or pants, pleats are not yet back on fashion, so don’t risk wearing trousers with pleats. Safety should be number one priority when it comes to factory or outdoor work. Places like factories have sharp objects carelessly left lying on the ground, so you will need to wear cool but protective work shoes. If you manage the factory and you find your self working in both the office and also supervise the work in the factory, I suggest you have these shoes with you at work, so, any time you switch responsibility, you will need to switch work shoes as well. This Steel Toe Work Shoe features a protective toe rubber cup which will ensure that your foot is safe. Their is something great about these shoes, and that is the neoprene material on the sides and back of the shoe, this material keeps the shoes light and comfortable, so, you can wear them the all day without feeling any discomfort. When it comes to styling these Steel Toe Work Shoes, you can team them with jeans or cargo pants. 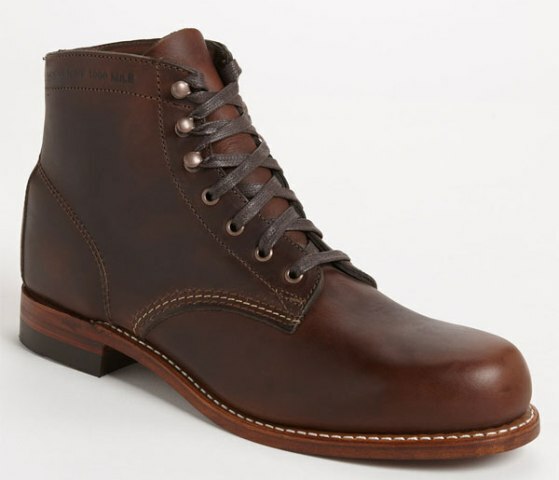 Guy’s if you don’t like those sharp toe boots, then this round toe boot will be the option for you. The boots are comfortable and fashionable, so you can wear them with jeans to work. When it comes to durability, the boot features a rugged water-proof leather upper , a rubber sole, partially sewn-in tongue and a stain resistant upper leather. So, no matter how rough your workplace might be, these boots will survive hash working conditions and they will still look beautiful. See, how the front toe is raised, it will ensure that your foot is protected. They look tough on the outside but comfortable on the inside. 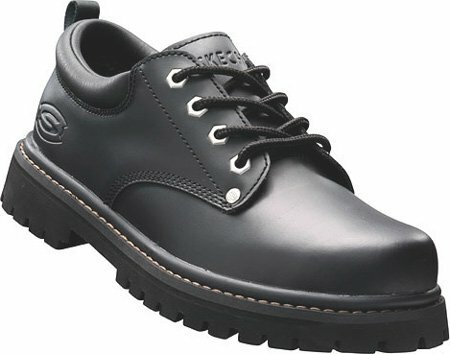 This skecher work shoe differs from most work shoes, it has a cool design, it’s lighter in weight so you can wear it to at work and on casual days, it provides extra ankle support using a padded collar, the lugged out-sole will ensure durability. So, don’t wear ugly work shoes to work, opt for this cool skecher. The shoe comes in different colors which include Black Oily Leather, brown, and dark brown. When it comes to styling them, you can opt for relaxed fit denim jeans. On Fridays’ and weekends, you will see men wearing these driving shoes to work, they’re very comfortable and easy to wear because of their slip-on style. Moccasins are good work shoes because they tend to be very light and comfortable on the inside, so you will feel like you have no shoes on you while at work. This moccasin feature a full-grain leather upper, a slip-on style, rubber sole, wrapped collar lacing and a fabric lining which is super soft and comfortable. What to wear with this moccasin navigator shoe? Tip 1: If you want to wear them to work, you can team them with a pair of straight leg denim jeans. You can complement your jeans with a polo t-shirt or a round neck t-shirt. Match the shoes with a brown leather belt. 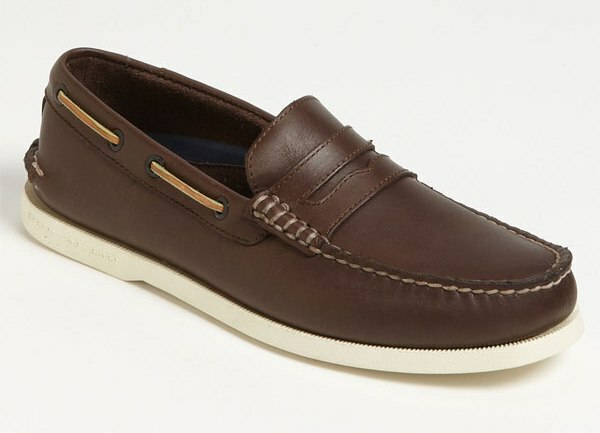 However, for guys who wear chino pants or khaki pants to work, you can team your chinos with this moccasin. When it comes to choosing work shoes, I will not skip slip-on loafers. Men, you will agree with me that lace-up shoes are a burden in the morning, because you need to spend some time tying those laces. I know some lace-up shoes are cool, but the fact that they need extra work to wear them, I prefer slip-on work shoes. 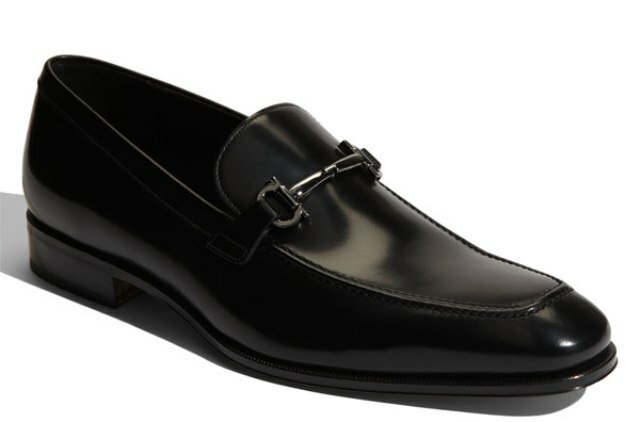 This black loafer will match with all formal trends. Since black is a neutral color, you don’t have to worry about colors. This Toe’ Bit Loafer features a buckle strap which will ensure that the shoes fit you well, leather upper and leather sole. You can wear them with suits, flat front trousers, chino pants and formal straight leg jeans. Remember to complement them with a black leather belt. Dockers have been on fashion for long than most work shoes. They have a simple formal look, if you don’t want to wear skechers in position (6), you can opt for these Dockers. It is comfortable on the inside so you will feel relaxed the all day while at work; you can team them with chino pants and jeans. This Plain Toe Oxford docker features a leather upper which is water and stain resistant, this makes the shoes to be long lasting. The think foam insole and Oil-resistant rubber sole will provide you with a strong grip while at work. The padded collar and tongue makes them comfortable to wear even on rough days. The position of this caterpillar work boot does not matter on this list, to me what matters is the durability and comfort of the shoe. 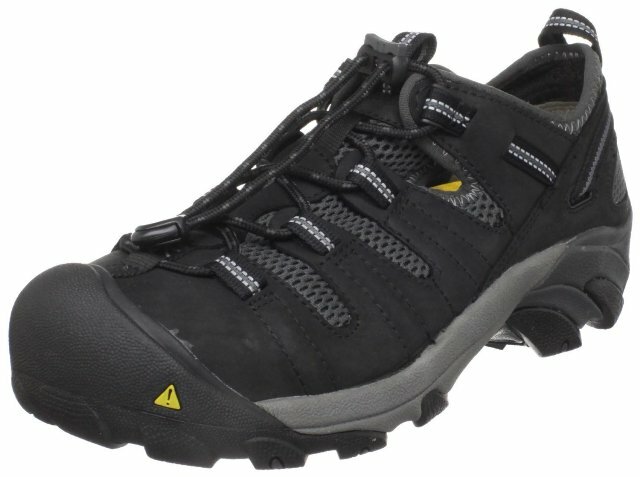 Men who work in risky / hash environments you will need extra protection for your foot. CAT is well known when it comes to creating the best work outfits and shoes. I just look at this shoe and predict its comfort and durability. If you think I’m lying, then buy the shoe and give us a feed back, otherwise these work boots go for as low as $129. 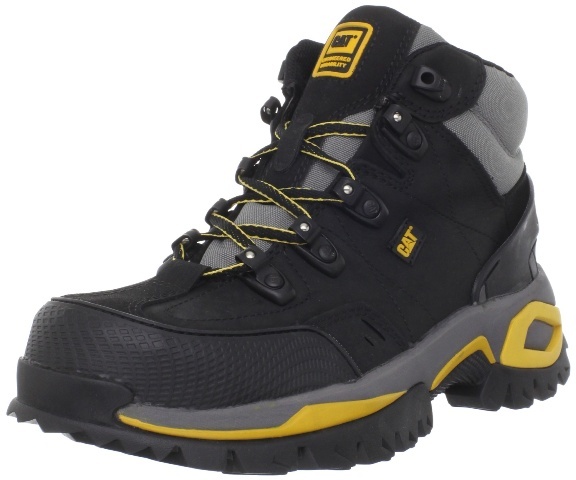 This Caterpillar Men’s Interface Hi ST Work Shoe features a nylon mesh insole, leather upper, a Manmade sole, oil and water resistant rubber sole which makes them stronger than most work boots. There is nothing special when it comes to styling these CAT work boots, you can team the, with jeans or cargo pants. 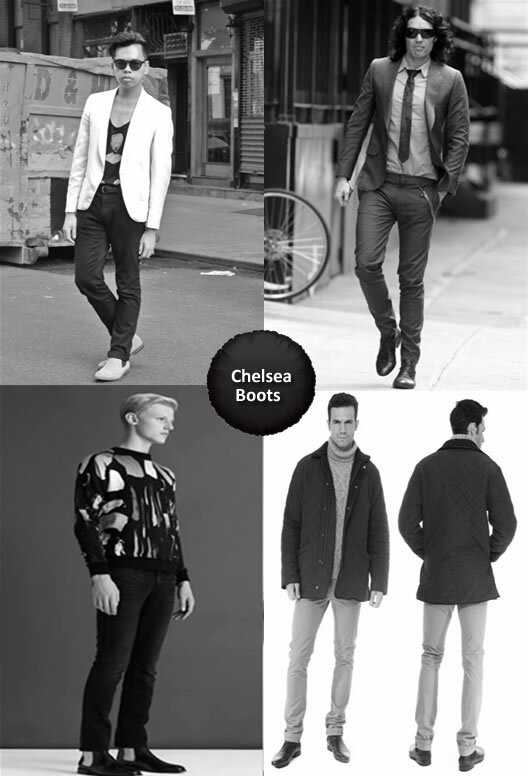 INTRODUCTION: Chelsea boots look formal and classic; however, you can wear them with both formal and casual trends. Chelsea boots are perfect for every man, it does not matter if you wear jeans or suits, and these boots will always look good on you. With their simple and clean style, Chelsea boots can be worn as career or dress boots, for those who hate boots with laces, I suggest you opt for Chelsea boots because they have no laces. You can wear these boots with skinny jeans, straight leg relaxed jeans, suits and chino pants. 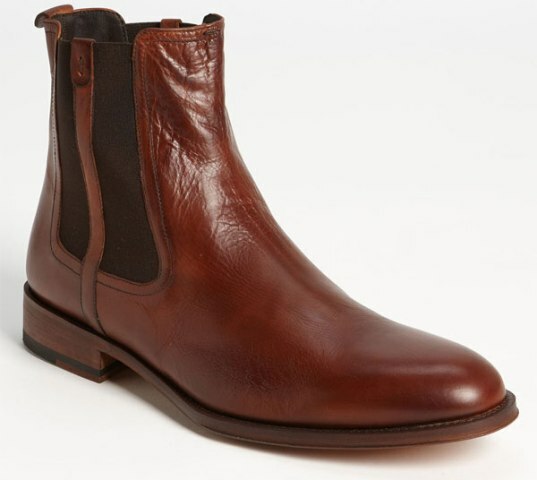 So if you want to dress to impress, you can opt for any on these top ten Chelsea boots I have listed here. Today on Olixe, I have compiled a list of the best Chelsea boots every man would love to wear, your choice for boots might be different from mine, but I’m 100% sure that you will not fail to find your test on this list. NOTE: Links to stores where you can buy these Chelsea Boots for men are listed at the end of this post. Simplicity and class is what I consider when grading shoes, this Chelsea boot from Prada makes it to the top ten list of the best Chelsea boots. It comes in black only, however black is a neutral color, so it will match with everything. The boot features glowing leather upper and a rubber sole which makes them durable and classy, the shining leather will look good on formal outfits. If you’re looking for work shoes, dress boots or career shoes, please, consider this boot because it has a versatile design. What to wear with this black Chelsea boot? Tip 1: Team these black Chelsea’s with a grey slim fit suit. Then complement the grey suit with a pink dress shirt and accessorize with a slim black tie. Tip 2: You can wear them with flat front trousers. In this case complement your trousers with a cufflink dress shirt and a tweed jacket. Tip 3: If you love wearing chinos to work, then these black Chelsea boots will match with fitting chino pants. To look fashionable, you can match your brown chinos with a sky-blue dress shirt, then wear a navy blue double breast coat and a red check slim tie. This is my favorite color when it comes to boots and dress shoes. 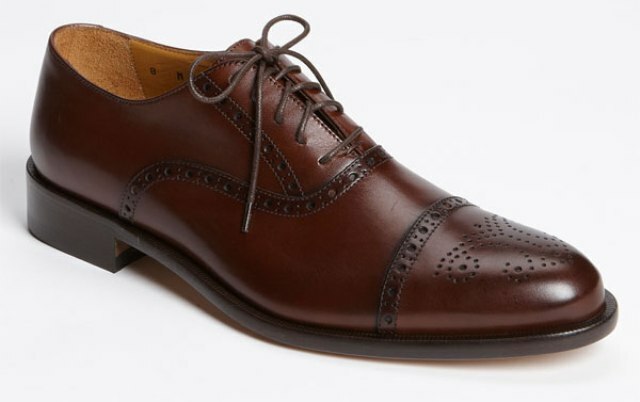 It has this brogue style on the front which makes it unique and easy to match with both formal and casual outfits. 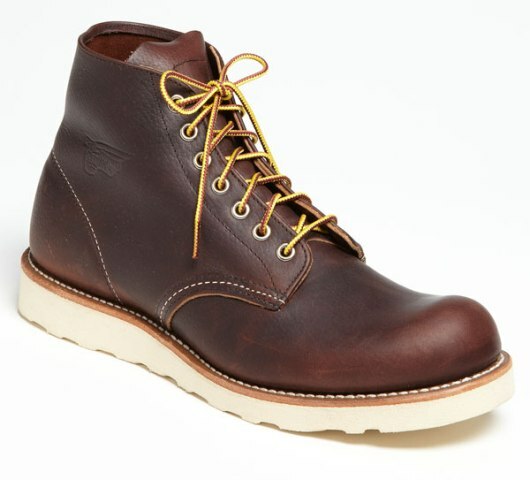 The boot features a shinning brown leather upper, leather sole and leather lining. You can wear this brown boot with jeans, suits and classy chino pants. Tip 1: If you’re great fan of jeans, this boot will match well with formal straight leg jeans. To look smart and formal, you can wear a white or pink dress shirt and complement the boots with a brown leather belt. 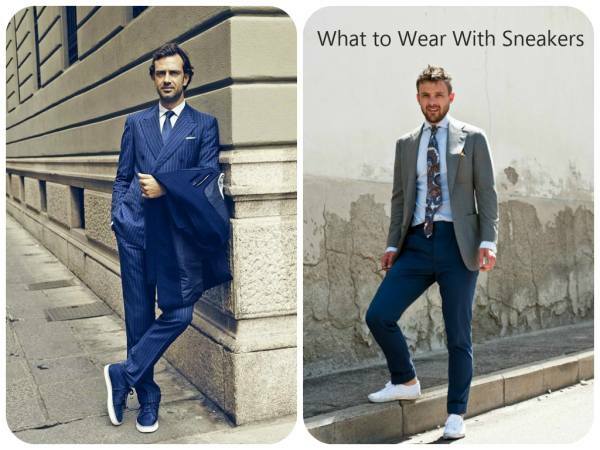 Tip 2: You can also wear them with a suit, in this case, we should opt for a grey or navy blue suit, also a black suit will match but not as good as Grey & Navy Blue. Tip 3: How about teaming it with a dark pink trouser, I know the color sounds strange, but if you complement it well, you will look fabulous. For example, you wear a white slim-fit dress shirt with your pink trousers; and then wear a dark yellow sleeveless sweater over the white shirt and a green double breast jacket over the sweater. This is a color blocking trend, so if you’re not comfortable with bright colors, please opt for dark ones. 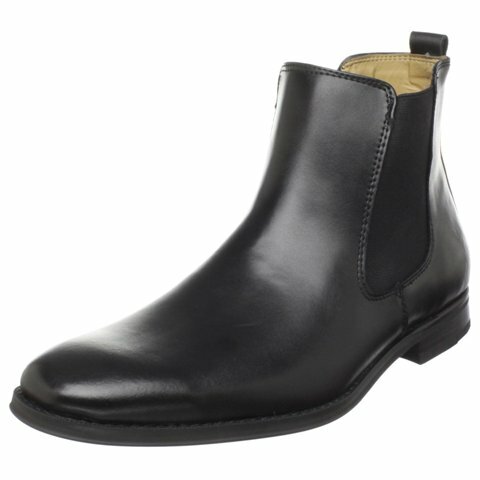 This sleek leather Chelsea boot has a versatile design, you can wear it to any occasion. 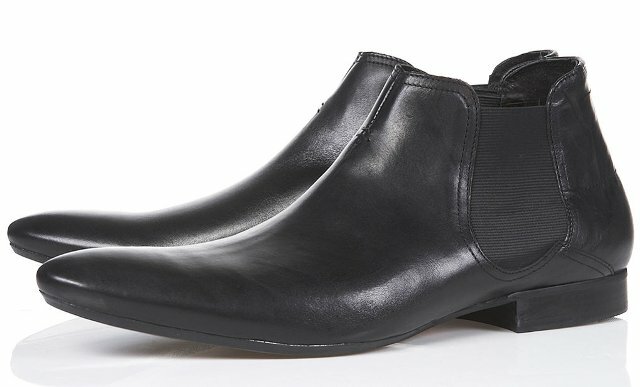 For those who want to wear boots with skinny jeans, you should try out these sharp Chelsea boots. It features an elastic gore which ensures that the boots fit you well, soft leather upper, leather and rubber sole for durability and quality. Tip 1: In my opinion, I would team them with grey skinny jeans, and then complement my jeans with a white slim fit t-shirt and a black leather jacket or blazer. Tip 2: If I wanted to wear them to work or business meeting, I would pull them with a black slim fit suit and a maroon / blue dress shirt, then accessorize with a black slim tie. This Desperado’ Chelsea Boot is more of a casual Chelsea boot, so you can team it with trendy casual outfits. The boot features soft leather upper and leather sole. The elastic gores make it easy to wear the boots. When it comes to styling, you can wear this brown Chelsea casual boot with denim jeans. To look fashionable, you can complement the trend with denim designer shirt, if its a long sleeved shirt, fold the sleeves of the shirt. Then for the jeans, opt for boot-cut jeans because they drape well on such boots. I’m a great fan of oxford shoes and this Chelsea boot is a combination of oxford style and Chelsea. It’s a cool casual boot which can match with trendy casual outfits. It’s versatile styles makes it a must have boot in every guy’s collection. The boot has a mildly distressed design and the brown leather / rubber sole just adds value to the boot making it unique. When it comes to comfort, no Chelsea boot beats this Neal’ Wingtip Chelsea Boot. The boot features weathered suede upper, leather lining and a rubber sole. 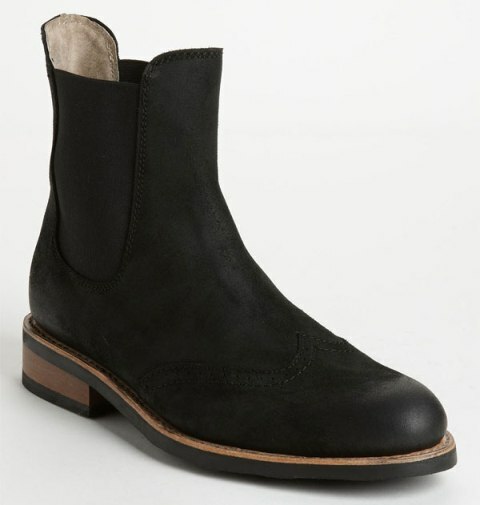 What to wear with this black Neal’ Wingtip Chelsea Boot? Tip 1: It is a casual boot, so it will look good when matched with trendy jeans. However, this boot has a distressed style, so damages jeans, twisted boot cut jeans and distressed jeans will match with this boot. You can add value to your style by wearing a designer t-shirt with your jeans and complement the boots with a black suede casual belt. Now, this is the type of Chelsea boot you can wear with both suits and jeans. It’s a classy boot which features calf leather upper, leather lining and a stitched leather sole. This Sunday – Chelsea Boot comes in four different colors and these include black leather, brown suede, brown leather and tan leather, so you will have more than one option. 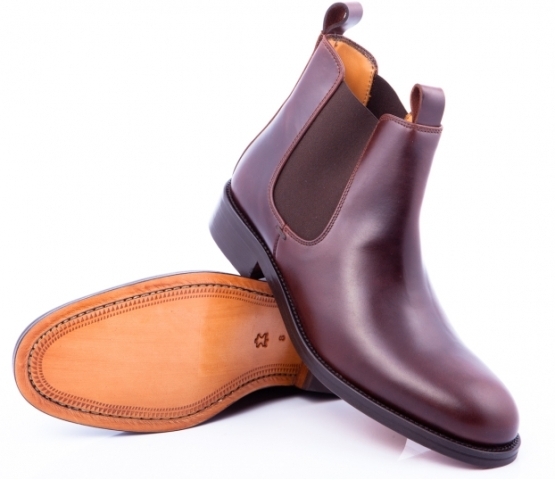 So if you’re looking for fashion boots to wear on weekends with those trendy denim jeans or men’s dress boots for work, look no further, this is the right Chelsea boot for you. Note: If you team these boots with jeans, make sure that you opt for jeans with a formal classy style. Avoid wearing distressed or damaged jeans with such boots opt for the simple fade or no fade straight denim jeans and complement the boots with a matching leather belt. If i was to wear these boots with jeans to work or on weekends, I could pull them with a dark denim blue jean and a check long sleeved shirt. 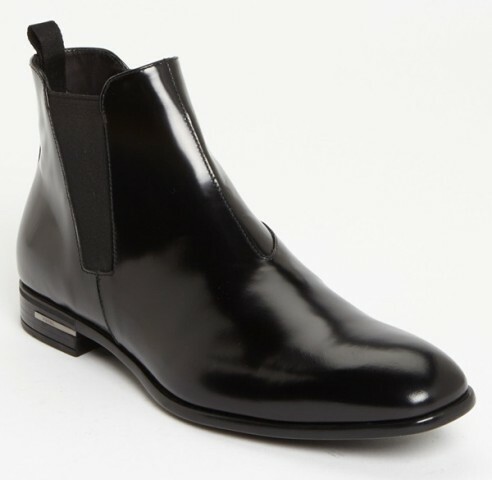 These black Chelsea boots can match with both skinny jeans and suits or trousers. I love the style and shape of these boots, the sharp pointed toe makes them look trendy, and they also have high quality soft leather upper and a rubber sole which makes them durable. 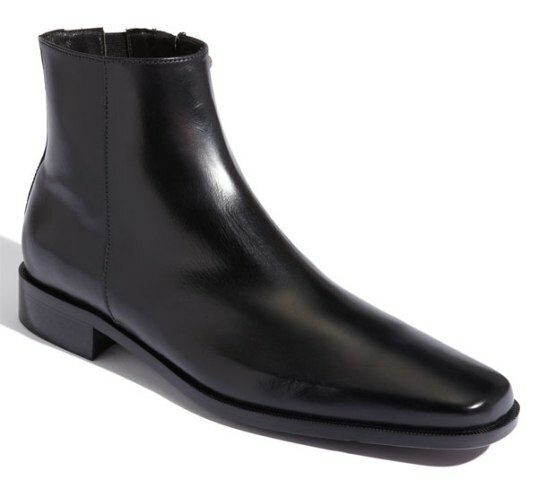 Unlike most Chelsea boots, you will not spend more than $100 on this Bass Men’s Amsterdam Ankle Boot, it comes at an affordable price yet it looks cool. So combining its elegance and affordability, this Bass Men’s Amsterdam Ankle Boot makes it to the top ten Chelsea boots for men. Wing tip Chelsea boots tend to stand out from the rest of Chelsea boots. 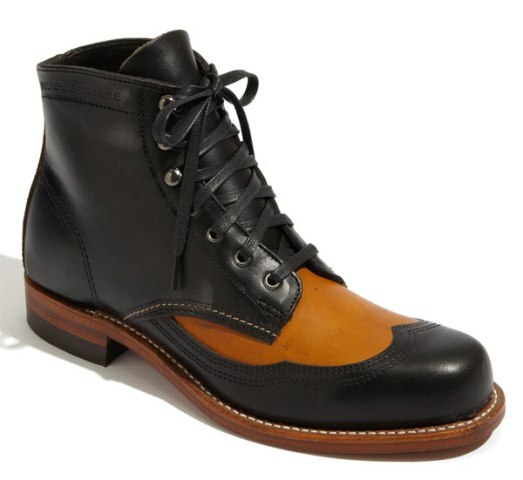 Men, if you want to dress to impress women and people around you, then opt for this Wing tip boot. Judging from its style, you can team it with both jeans and formal outfits like flat front trousers or suits. Since these boots are brown, you will look fashionable if you team them with a navy blue slim-fit suit, grey suit, denim blue straight leg denim jeans, black jeans or trousers. However, you should always remember to complement them with a brown leather smart belt. 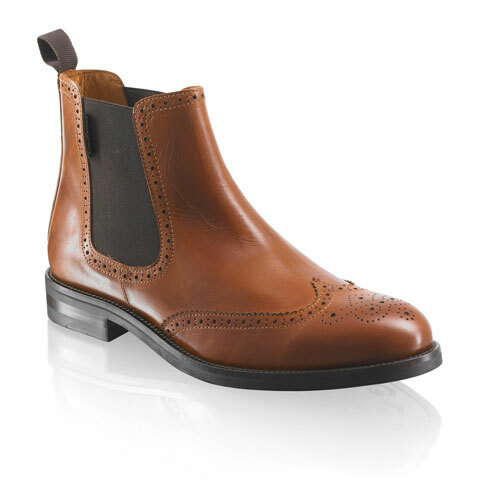 This STRATFORD Wing Tip Chelsea Boot features a durable rubber sole, leather upper, leather lining and a brogue style. You can wear them both on weekends and work days. They might not look that classy, but i lets be fair to those guys who wear skinny jeans, most of the chelsea boots listed on here cater for suits and straight leg jeans, but this Hudson ‘Moran’ Chelsea Boot will match with your skinny jeans. They feature a soft leather upper, pointed sharp toe, and a rubber sole, make sure you opt for a larger size than your normal shoes because this pointed toe makes the boots tight. A bit different from boots in position (9) , these short Chelsea suede upper boots will match with both jeans and chino pants. They have a trendy casual style, so you can wear them with jeans to work. So if you’re not comfortable with ankle boots, they opt for these short boots which stop just below the ankle. 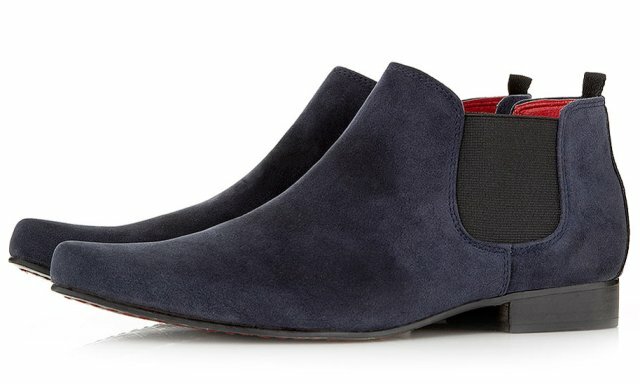 A navy blue velvet blazer will look good with these Juan’ Low Chelsea Boots. Sneakers have come a long way, they used to be shoes for the gym, basketball court or jogging, but now we have different types of sneakers and also the way to style them differs. For example, (a) high top sneakers, these look more like basketball sneakers, you can wear them with baggy jeans, and skinny jeans a good example of high top sneakers is shoe in position (5) (b) Classic sneakers, these are basic flat sneakers, the ones you can wear with anything, a good example of a basic sneaker is shoe in position (7). Then we also have the sports sneakers, the ones you can wear for jogging and at the same wear them as casual shoes, good example is sneaker ( 8, 9, 10 ). As you can see the options are quite wide, so each of us can wear a sneaker. However, they’re some do’s and don’ts for sneakers. For example, do not wear high top sneakers with flared jeans or to an interview. Don’t wear above the ankle socks with classic sneakers, opt for short socks. Don’t wear high top basketball sneakers with chinos to the office, you will look awful. Today on Olixe, I have compiled a list of the best sneakers for men, your choice for sneakers might be different from mine, but I’m sure you will not fail to find a sneaker which fits your style. NOTE: Links to stores where you can buy these Sneakers for men are listed at the end of this post. These skater Vans looks a bit unique with their soft leather upper and comfortable lining makes them the best Vans for men. In 2014 we shall witness many changes in street fashion trends, but Vans and sneakers will always have a similar style, so don’t expect a new design of Vans very soon, though the durability and comfort will always improve. You can wear this sneaker with denim shorts and relaxed leg denim jeans. These Vans Men’s VANS SK8-HI SKATE SHOES 11.5 (NAVY) and feature suede – leather upper, textile lining and a rubber sole. So, let’s see how you can wear these Vans for men? Tip 1: You can team them with jeans, keep the trend very simple but stylish by complementing it with a long sleeved flannel shirt. If you want to look a little bit unique, you can opt for designer t-shirt and a seal brown leather jacket. These Saucony Originals Men’s Bullet Running Shoe,Charcoal/Red,9.5 M USwill fit you well and they’re very light so you will feel comfortable if you wear them for the all day. This black and white sneaker will match with most casual trends, so if you plan to go for a vacation, I suggest you get these cool sneakers. However, you don’t have to work out in these sneakers because they look too casual, if you want to work out, you should opt for running sneakers like the ones in position (9). However, you should go for a bigger size, for example, if you wear size 8 in normal shoes, opt for size 9 when it comes to these sneakers because they tend to be small and tight. This Bullet Sneaker features nylon upper with suede on it, rubber sole, lace-up style and a soft foot-bed. Classic sneakers will always rock, it does not matter which designer or color you opt for, and these sneakers are easy to wear. I own a pair from DG but I match it with work jeans, I actually prefer wearing these classic sneakers to work than wearing dress / career shoes. You can get them in any color or material, some have a textile upper whiles others have leather upper. 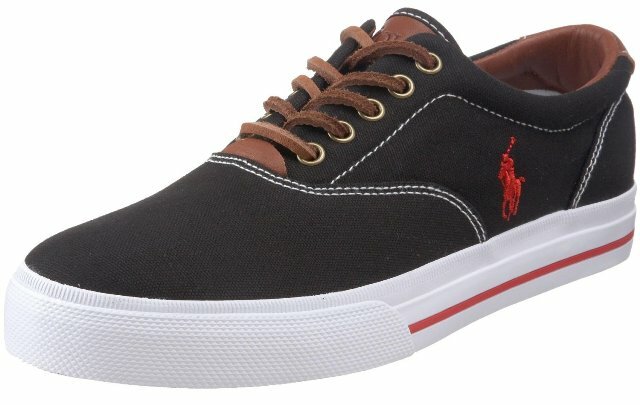 This is a classic sneaker from Polo Ralph Lauren; Polo Ralph Lauren Men’s Faxon Low Fashion Sneaker,Deep Royal/Citrus Yellow,9.5 M US and feature an embroidered pony logo on the sides, rubber sole, textile upper and a soft foot-bed which makes them comfortable. You can wear classic sneakers with jeans, shorts, cargo pants, chino pants and track pants. However recently, I have seen some men wearing them with suits, some may argue whether this trend is acceptable on certain occasions but it certainly is now fashionable, so if your not sure please don’t try it. This is the type of sneaker you can wear with slim fit jeans and feel like you own the street because they feel so comfortable and they look stylish. Onitsuka Tiger Men’s Ultimate 81 HN201.2313 Lace-Up Fashion Sneaker,Red/Light Grey,12 M US, so once you fall in love with them, you might find your self ordering the other colors. This castle rock / yellow sneaker features leather & textile upper, rubber sole, textile lining which provides extra support. This model used to be a running shoe because they have flat bottom, but fashion has advanced, now these sports shoes can be worn on streets. You can wear them with slim fit jeans, shorts, and skinny cargo pants. If you want to wear socks with these sneakers, make sure the socks are below the ankle. Please, so don’t wear flared or buggy jeans with this small sneaker, those two types of jeans have wide bottoms which will cover the top and beauty of the sneaker. PUMA is well known for making sports shoes, this time Puma has crafted a trendy running shoe, PUMA Men’s Osu 3 Running Shoe,Grisaille/Black,10.5 D US, it fits well and its very light and flexible. These Puma sneakers breathe well so your foot will have no moisture as you run. Basically these are sports shoes; you can also wear them as street casual sneakers with jeans. Stick with the classic sneakers, these flat simple sneakers can match with most casual trends and they also look a bit representable. If you wear classic sneakers, feel free to fold the bottom of your jeans or chinos. It is not a crime to fold your pants just above the ankle to show off the beauty of your classic sneakers. But remember not to show us your dam socks. Discard worn out sneakers and buy new ones. I know you have some attachment on that pretty sneaker bought for you by your wife or girlfriend, your so much in love with them and that is the reason why they are worn out, so please, buy new sneakers. Don’t wear court sneakers to a party or any casual place or work. These shoes are meant for playing basketball or tennis, so please save us the shame, make it easy for others to associate with you by wearing the right sneakers to the right place. Don’t wear sneakers to a job interview. Guys, I know you love those cool sneakers from NIKE, ADIDAS OR PUMA, but a job interview requires you to wear career shoes, okay, if your not comfortable with most career shoes, opt for boat shoes. Don’t wear long socks with classic sneakers. If you wear a sneaker like the one in position (1), and you also feel like wearing socks with them, opt for very short white socks. Then if you wear high top sneakers, make sure that the socks don’t go above the sneakers. Don’t wear ultimate sports sneakers with suits or trousers. My former boss used to make this blunder and he looked so funny and disorganized. It does not matter how expensive your ultimate sneakers cost, you will look awful. Men above 40, please ignore sneakers with prints. My favourite designer Ed Hardy makes these printed sneakers, but they only look good on teens and youths. When you hit 40 years of age, you should opt for simple plain colored sneakers. Don’t wear classic flat sneakers or high tops for sports or jogging. Remember that most of the injuries we get while exercising are caused by wearing wrong shoes. These classic sneakers and high tops have a flat bottom, so their footbed is not as soft and NIKE AIR SNEAKERS, which means if you wear them as sports shoes, your foot will get to much pressure from the ground which will result into ankle injuries. Don’t wear sneakers when they are wet or when your foot is wet or when your socks are wet. These shoes have a textile lining which will keep this water for long, so wearing such sneakers will expose your foot to fungal infections, and your feet will smell badly. Slip-on shoes are easy to wear because you don’t have to battle with laces. Slip-on shoes differ in style, some are boat shoes, loafers or penny loafers and espadrille slip on shoes. They also differ in design, some are casual while others are formal. You can wear slip-on shoes with any fashion trend basing on their design. For example; formal slip-on shoes like the one in position (1) & (3) will match well with suits and formal trends, yet casual slip-on shoes like those in position (4) to (10) will match with casual trends like jeans and chinos. When selecting slip-on shoes, make sure you opt for fitting shoes, unlike Lace-up shoes which you can tighten using laces, these slip-on shoes will require you to wear real fitting pairs, so try them out before paying for them in a nearby shoe store, if your buying them online, be sure of the size, other wise you will need to return them back. Today on OLIXE, I have compiled a list of the best slip-on shoes every man would love to buy, i know you have your own test for shoes, but at least you will not fail to find your choice on this list. NOTE: Links to stores where you can buy these SLIP-ON shoes for men are listed at the end of this post. Salvatore Ferragamo is a popular designer known for his classy trends. This black leather slip-on shoe is one has managed to score on the top ten slip-on shoes list. It’s simplicity makes it a super career or dress shoe. This Fenice’ Loafer features a slip-on style, leather upper, leather sole which adds to its quality and durability. You can wear this shoe with most formal trends. 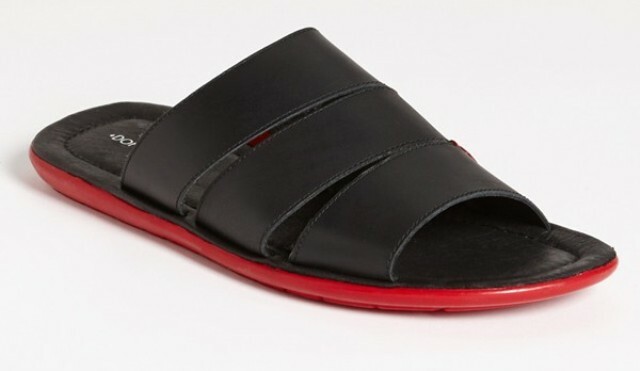 So, let’s see what you can wear with this black slip-on shoe for men? Tip 1: Team these cool black slip-on shoes with a suit. Any types of suit will match with this trendy shoe because black is a neutral color which matches with most outfits. Complement them with a black leather belt. Remember to wear socks and a slim tie with your suit. You can also team these shoes with a formal trouser and chinos, but finish your attire with a cuff-link dress shirt and a black blazer if you want to wear one. Tip 2: Do you wear formal jeans to work, if yes, then you can as well wear a simple fade denim straight leg jean with these slip-on shoes. To look smart, you wear a dress shirt with your jeans, tuck in the shirt and match the shoes with a smart black leather belt. Liked by many and worn by a few, why? .Because this shoe has a high price tag. This Master’ Loafer will cost you as much as $540, so I beat very few men are willing to spend all this dime on just a single pair, but it is worth the price, so if you want to make a fashion statement and impress those who see you for the first time, opt for this cool Master’ slip-on loafer. It comes in a black color so you will have many options of matching it with other trends. The shoe features leather upper, rubber sole and a slip-on style. What to wear with this black Rich matte leather Loafer / Slip-on shoe for men? Tip 1: Let’s start with a casual trend. You can team these loafers with turner shorts, you can opt for a navy blue turner short, then match it with a vertical stripped long sleeved casual shirt, tuck in the shirt with the shorts then wear a teal blue one button blazer over the shirt, leave the last three buttons of your shirt open so that you feel free and stylish. If you’re so into accessorizing, you can opt for dark shade sunglasses. Tip 2: You can as well team these slip-on shoes with straight leg jeans, just play the all trend simple by complementing your jeans with a white v-neck t-shirt. This is not black or brown, it is Tmoro / Auburn color, very rare but common when it comes to classic shoes. Still Salvatore Ferragamo is the designer of this trendy slip-on loafer; it is also a dress shoe just like shoe in position (1). You can wear it to work, job interview, business meeting and any formal occasion. The slip-on style makes them easy to wear; this style will save you the time you could have wasted in the morning tying laces. Bramante’ Loafer features leather upper and leather sole. 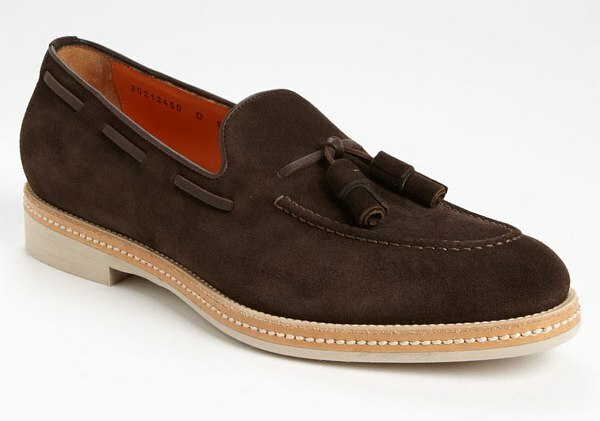 What to wear with this Bramante’ Loafer / Slip-on for men? Tip 1:- You can team this timeless loafer shoe with a navy blue or grey suit. These two colors will match well, so you can complement any of those suits with a white / pink / stripped blue and white dress shirt. Match the shoes with a dark brown leather belt. Tip 2:- You can also team them with formal jeans and chino pants. But you have to look formal, so you can go for check dress shirt or polo t-shirt. The shoe is stylish and trendy, it is more than a typical leather casual shoe, it’s very comfortable on the inside and the soft rubber will make you feel like your walking on air. I know, you’re comfortable with those vans, but guys, just try out this new Men’s Timmons Slip-On Casual Shoe, it comes in various colors but i decided to go for this dark grey shoe because it is very easy to match with most casual trends. However, you should remember that when choosing a slip-on shoe, it has to be fitting, other wise you might be disappointed. 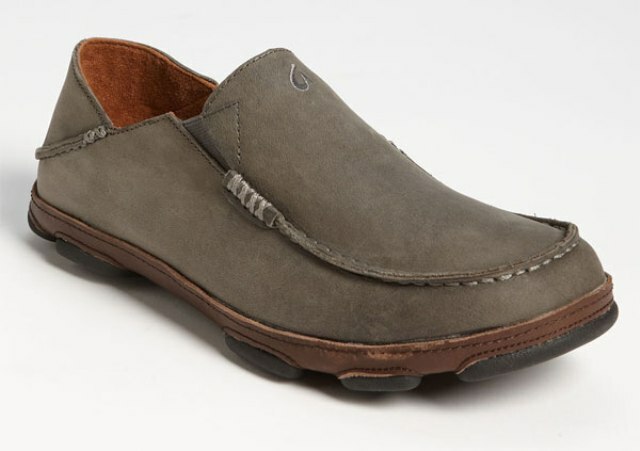 These Men’s Timmons Slip-On Casual Shoes feature a rubber sole, leather upper and a highly padded collar. What to wear with this Men’s Timmons Slip-On Casual Shoe? Tip 1: These are casual shoes, so you will probably have to wear them with denim jeans, however, dirty damaged jeans will not look good on these shoes, opt for the simple fade jeans or those with simple damages, make sure your jeans have straight leg fitting because flared jeans have a wide bottom which can cover the shoes. So let’s do some color mixing, you wear a denim blue flash jean with a black fitting shirt or t-shirt, then complement your trend with a gray blazer. 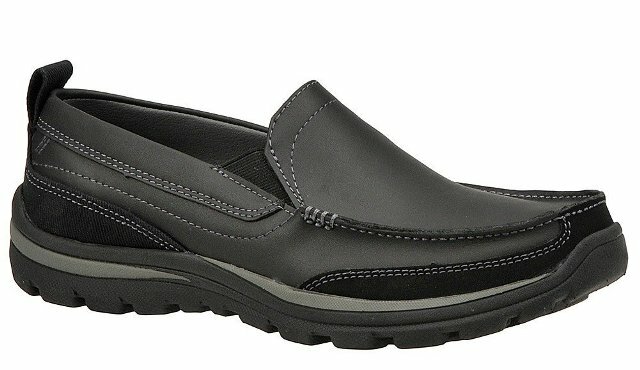 If your under 30, you might not like this shoe, because it has this old school design which might not please your age bracket, but I assure you, try to buy them for your father, he will be happy and impressed, those old folks love these Dwight loafers because during their times, this was on of the best slip-on shoe. This brown loafer features leather upper and a natural latex insole. 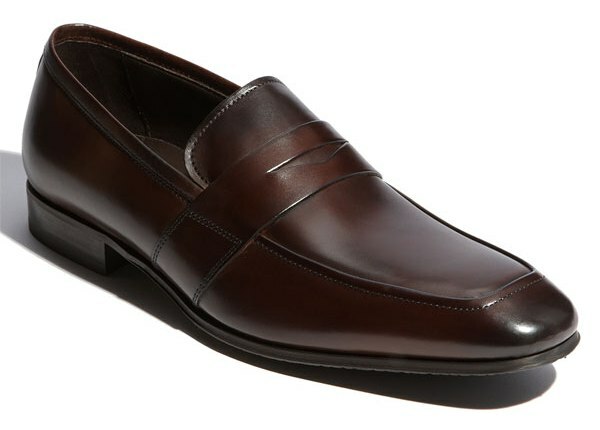 What to wear with this Dwight Slip-on loafer shoe for men? Tip 1: Khaki or chino pants are my best choice when it comes to these Dwight loafers, you might decide not wear socks just in case you want to look casual, but if you want to wear them to work, then you will need to wear socks. Complementing your trend with a double breast blazer will be a good idea. Besides being extremely comfortable and easy to wear, these Olukai ‘Moloa’s’ Slip-ons are versatile, you can wear them the all day and feel no pressure yet you can match them with most casual outfits, so owning this Olukai ‘Moloa’s’ Slip-on shoe should not be a mistake. Once you choose the right size, i assure you, these Olukai ‘Moloa’s’ Slip-ons will fit perfectly. They feature soft and comfortable foot-bed cushions, water resistant leather upper, a slip-on style, gum-rubber pods which will provide you with extra traction and a rubber sole. You can wear these ‘Moloa’s’ Slip-ons with jeans, chino pants, khaki shorts and cargo pants. Bring that tropical charm to your wardrobe with these easy to wear slip-on shoes. 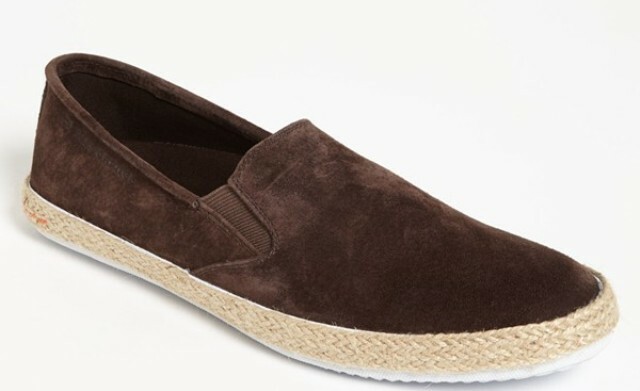 Now days Espadrille Slip-On shoes for men have become popular, Espadrille shoes used to be for women, but now men have Espadrille Slip-On shoes. These shoes are very light, good for casual days. You can wear them with shorts, linen pants and jeans. This fullio Espadrille Slip-On by BOSS features a rop-wrapped sole which makes them look exotic, suede upper, textile lining and a rubber sole. Skechers have got a good reputation when it comes to making durable comfortable casual shoes. Judging from the style of these shoes, they look durable and comfy , you can wear them with jeans, chino pants and shorts. 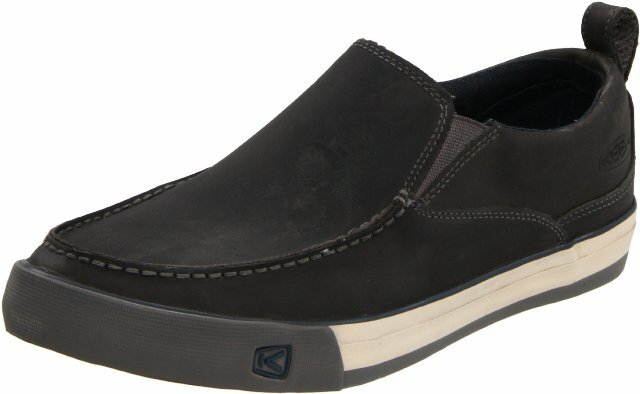 This Skecher Men’s Golson Belton Slip-On comes in three colors, black, brown and beige, so you have a wide option on which golson belton slip-on to wear, they feature oiled leather upper, rubber sole, a dual elastic side which makes it easy to wear, they also have a hand stitched and a back pull loop. I guess you wear these skechers to work with chinos or jeans. Guy’s if you didn’t know that Skechers is an award-winning global leader in making lifestyle walking shoes, then you’re probably missing out on some comfortable trends. It is time you add a casual comfort shoe to your wardrobe, this is the type of shoe you can wear to work or on weekends and have fan with your friends without feeling any pressure on your foot. It is a versatile men’s slip-on casual shoe which features durable leather upper, stitched overlay detail which makes them unique and trendy, dual side goring and a pull-on heel tab. The truth is that, these shoes are very comfortable, you can compare them to slippers and they have a perfect fit. Tip 1: Judging from their casual style, you can team them with khaki or chino pants. Try to complement them with a black leather belt. Also simple fade straight leg jeans will look good with these shoes. These shoes come in four colors, brown , black, charcoal and white, so you will have a wide option on which color to opt for. Just imagine getting a feel of a sole with a closed shoe, yes that is what I mean. This Clifton Creek Slip-on shoe looks smart and trendy, you can pair them with jeans or any other casual pant, the flat sole and slip-on style makes them fan and easy to wear. They look more like shoes, but in actual sense, you will feel like your putting on slippers, they also have a very excellent support so your foot will get no pressure. This Teva Men’s Clifton Creek Slip-on shoe features leather upper, moc-toe stitching detail and a rubber sole. You can wear them on weekends or to work with jeans and khaki pants. 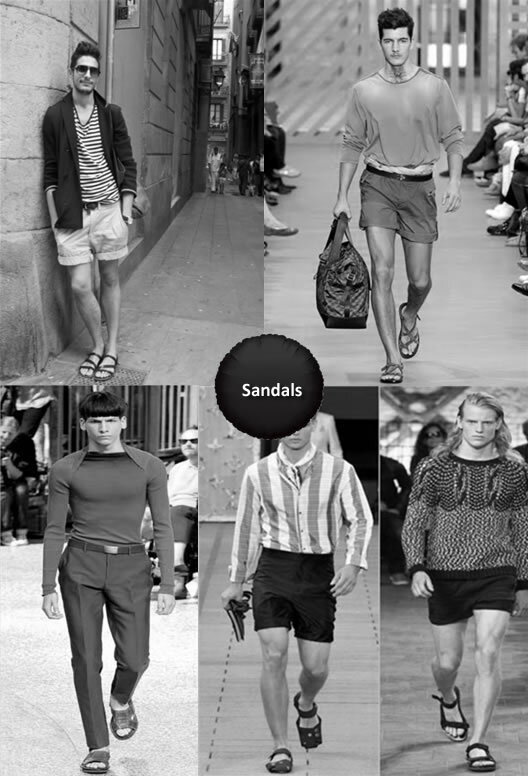 Sandals differ in style, we have those with a formal design and those with a casual design, men who want to wear sandals with chinos, linen pants and trousers will opt for the formal sandals, then if you want to wear shorts, jeans or cargo pants, casual sandals will work for you. Sandals are casual shoes, so you can only wear them on weekends or out of office. Please, don’t wear sandals to work, I know they’re too comfortable, but if you want to feel comfortable while at work, then opt for loafers or boat shoes but not sandals. 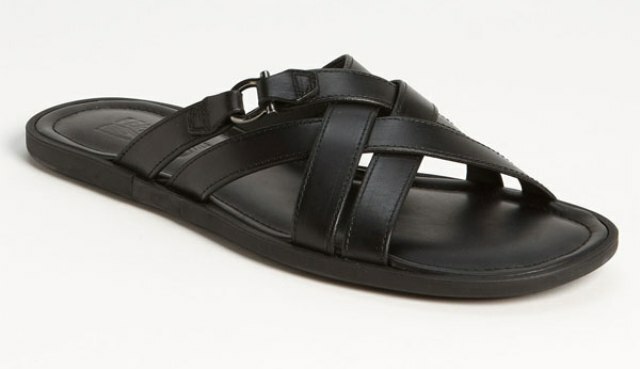 Some people have issues with their feet, they dry out so fast and crack especially in summer, my advice is to wear closed sandals like the one in position (4) , some times i see men wearing socks with sandals, you can also try it, if you have foot issues. 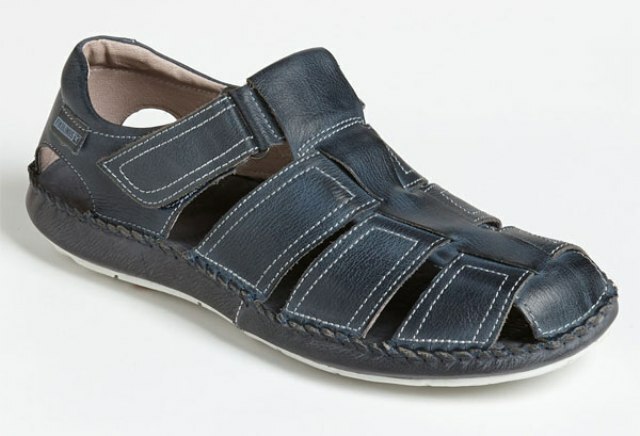 Today on Olixe, I have compiled a list of the best sandals for men and i have briefly explained what to wear with each of these sandals. 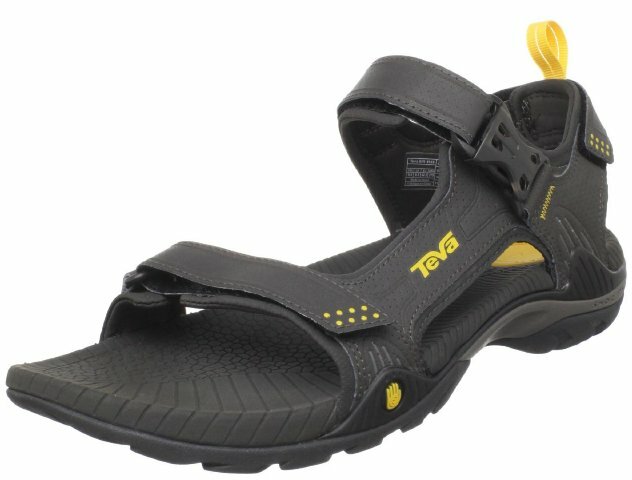 NOTE: Links to stores where you can buy these SANDALS for men are listed at the end of this post. As you plan to wear outdoor sandals, you also have to think about the safety of your foot, this Newport H2 Sandal has an enclosed rubber toe which will cover and protect your toes. It features a rubber sole, a quick-draw bungee lacing system which makes them easy to wear. This is a casual sandal so you can match it with various casual trends. 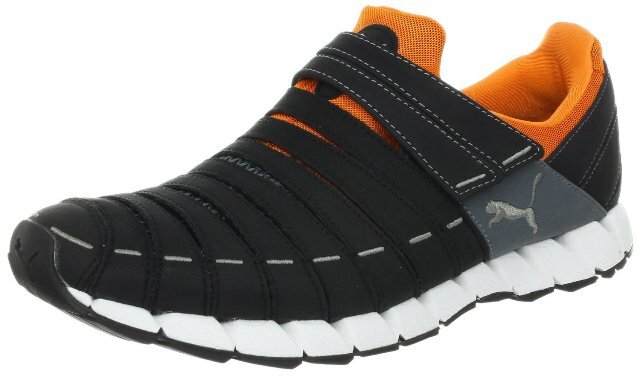 Let’s see what you can wear with this Newport H2 Sandal for men? Tip 1: Judging from its style, you can team it with shorts. Both denim shorts and cargo shorts will match well with these sandals. 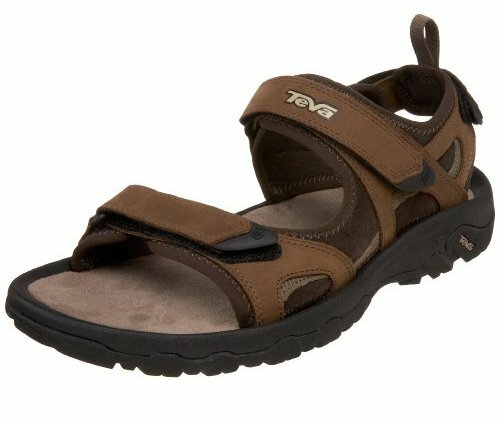 Remember, these sandals are not good for hiking, even though they look comfortable, wear hiking boots or sneakers not these sandals. You can complement the shorts with a round neck t-shirt and a jumper if necessary. This is the type of sandal you can wear with both shorts and pants. 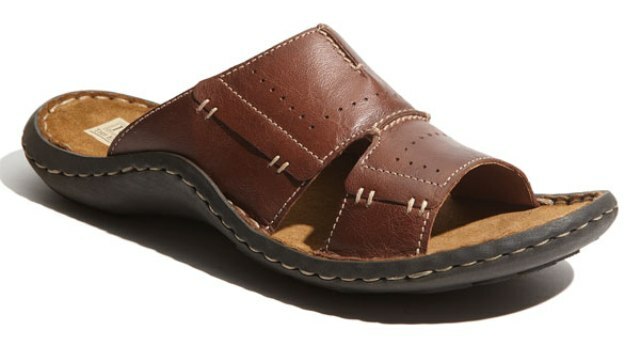 Slide sandals are easy to wear, this Larry’ Slide Sandal features leather upper, slip-on style and a polyurethane sole. The options of styling this sandal are limitless, for example, you can wear it with linen pants then complement the trend with a slim fit linen shirt, you can team them with chino pants or jeans, to look fashionable in this trend, you can wear a casual blazer and a plaid shirt. What else can you wear with this slide sandal? Tip 1: You can team it with a flat front trouser because it has a formal style, then wear a long sleeved tight t-shirt, to look formal, tuck in the t-shirt and match the sandals with a brown belt. This is one of the most popular outdoor sandals. I see many people wearing this style of sandal. They look durable and comfortable; you can even wear them for an evening walk. 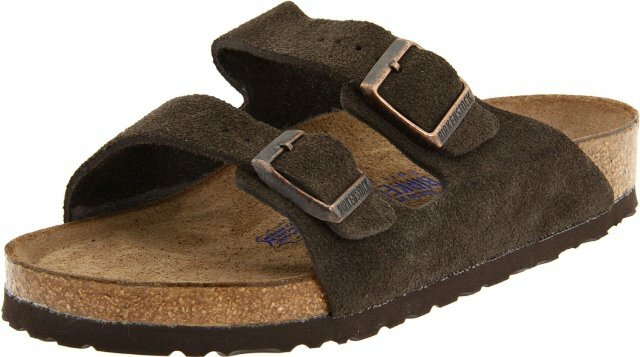 This sandal is unisex, so both men and women can wear it. It features full grain waterproof leather and an anatomical microfiber foot bed which makes them durable and comfortable. 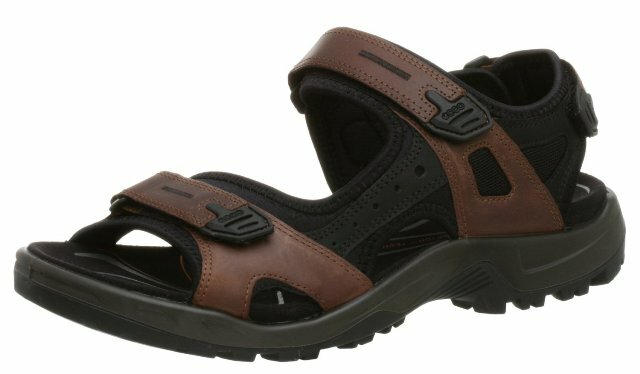 What to wear with this Cocoa Leather Outdoor Sandal for men? Tip 1: It is casual in style, so team it with cargo pant. In this case, you can opt for fitting cargo pants and also make sure that they don’t cover the top of the sandals. You can also team them with jeans and shorts. But don’t wear them with linen pants or trousers. You want to wear sandals to work on Friday or weekends but you’re confused on which sandal to wear, it is okay, opt for this Tarifa’ Sandal, it looks more like a close-up shoe which makes it a bit formal, so you can team it with casual-formal outfits like khaki pants or non-fade straight leg denim jeans . This sandal features leather upper, leather lining and rubber sole which makes them comfortable and durable. What to wear with Pikolino Sandals? Tip 1: Since they have this formal look, you can team them with white chino pants, then complement the chinos with a black and white printed stiff collar shirt. Add value to this trend by matching the trend with black single button jacket. Make sure you wear a black belt because it will match well with these Pikolino sandals. When it comes to simplicity, i will opt for these Outdoor Performance Sandals, they have a rubber sole which is raised on the front to provide protection to your toes, and they also have an external shock pad heel for extra comfort. You can easily adjust it using the upper straps and get a perfect fit. If you wear them during a rainy season, your feet will dry so first because they use a Drain frame Technology which will evacuate water through the mid-sole and this will keep your feet dry. Tip 1: These casual outdoor sandals can match with jeans, cargo pants, shorts and linen pants. There is no unique way of styling this trend, try to be creative and match your trends very well. I love flip flops but the only thing i hate about them is that they’re not durable and comfortable like slide sandals. Though you can wear flip flops with most casual trends. 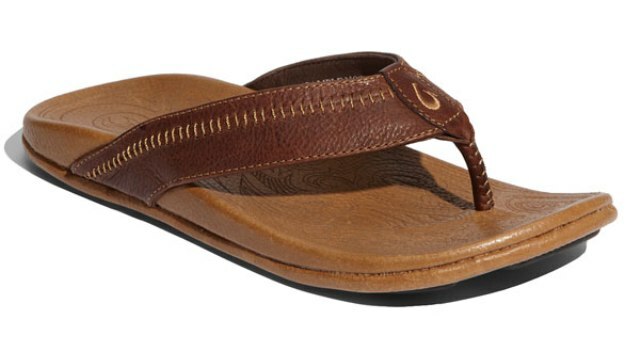 This Hiapo’ Flip Flop features leather upper, leather lining with rubber and leather sole. You can wear these flip flops with linen pants , chinos, flat front trousers, shorts and jeans. So you see, the options of styling them are limitless, all you have to do is to mix-match your trends in an appropriate manner. A soft foot-bed sandal is the best sandal for men who always have issues with their feet, these sandals are created in such a way that they will massage your foot and you will feel 100% comfortable. They look a bit corporate, and i have seen many corporate men wearing these soft foot-bed sandals. They feature suede upper, side lock style, soft foot-bed and a rubber sole. You can ware these Arizona Soft Foot-bed Sandals with trousers, khaki pants, jeans and shorts, cargo and khaki shorts will match with these sandals. If you want to look formal while wearing sandals, then this is the best sandal for you. Its slip on style narrow open toe front makes them look classic. You can team them with linen pants, straight leg formal jeans, chino pants, trousers and khaki shorts. Don’t ware socks with this Harris’ Sandal, but you can wear socks with sandal (7). This sandal features calfskin leather upper , a rubber sole and leather lining. 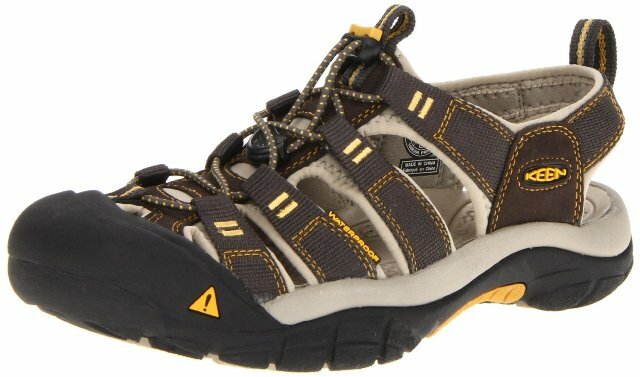 The only difference between this sandal and the one in position (3) is that this ECCO Men’s Yucatan Sandal has a raised front which will provide extra protection to your toe, so if you plan to wear outdoor sandals and go to a rocky or rugged surface area, you will need to opt for these ecco sandals. They feature leather upper, receptor technology in foot-bed which makes them comfortable. When it comes to styling these sandals, you will have a wide option on what to wear. For example, you can team them with jeans, shorts, cargo pants, khaki shorts and cargo shorts. If you wear them with chino pants, complement the trend with a collar t-shirt with horizontal stripes. The only thing i like about strap sandals is that you can wear them with anything, unlike other outdoor sandals. This black leather upper strapped sandal can match with both casual and formal outfits. For example, you can team them with trousers, shorts, chinos and jeans, however, due to their formal style, make sure that you complement your trends with casual but formal trends. For example, if you wear shorts with these Tirreno cross sandals; you can match your shorts with a casual blazer and a v-neck horizontal stripe shirt. The sandal features calfskin upper and a rubber sole. All penny loafers feature a slip-on style which makes them easy to wear, they also differ in style, some penny loafers are formal while others are casual in style, so the way of styling them will depend on their theme. Men who don’t want to wear socks or shoes with laces will always love these penny loafers. You can wear penny loafers as career shoes; they match well with chino pants, flat front pants, and jeans, so you will have more than one option of styling these penny loafers. 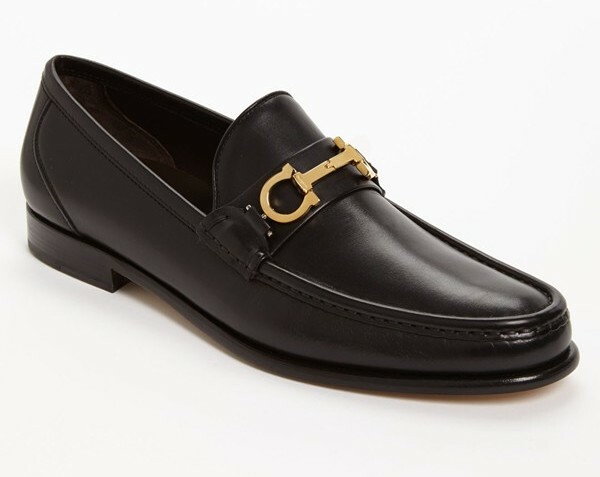 Today on Olixe, I have compiled a list of the best penny loafers for men, this is just a summarized list of top ten penny loafers, I believe every man has his own test for shoes. 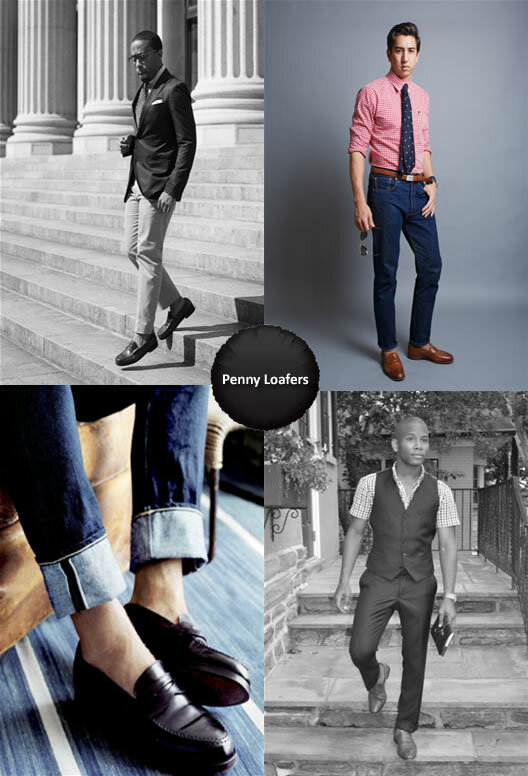 So I have featured top rated and most shared penny loafers online. In brief I have explained what to wear with each penny loafer. NOTE: Links to stores where you can buy these Penny Loafers for men are listed at the end of this post. This is a classic formal penny loafer you can wear to office or any business related activity, you can even wear it to a cocktail party. It is designed by Salvatore Ferragamo, it features leather upper, leather lining and a rubber sole which makes it durable. Men, who always want to make an outstanding statement on instant, wear such loafers. Its slip on style makes it easy to wear; you can wear socks or not depending on what you have matched with these shoes. 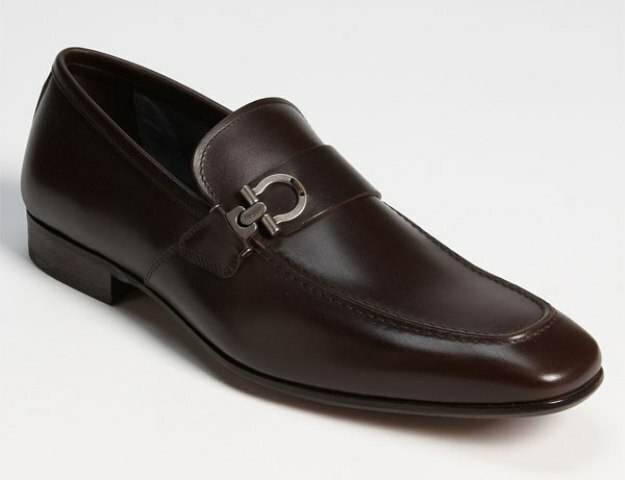 So, what can you wear with this brown classic formal penny loafer? Tip 1:- You can team these natural brown career loafers with a navy blue suit, however your style will differ basing on where you’re heading. For example, if it is a party, you can play it cool, by wearing a tuxedo white shirt and a navy blue slim fit suit, and then complement the trend with these brown loafers without wearing socks, make sure you match the shoes with a brown belt. If you’re heading to work or business meeting, you will need to wear socks and a slim tie. Tip 2:- For those who don’t want to wear suits, you can opt for flat front trousers, the best colors of trousers to match with these brown loafers are; gray, navy blue and black. Complement your trend with a classic dress shirt. This is a classy black loafer featuring calfskin which makes it unique and durable. Black is a neutral color, so this loafer will match with most fashion trends. It is both formal and casual, so you will have many options of teaming it with other trends. The slip-on design makes them easy to wear and the leather sole guarantees class and durability. 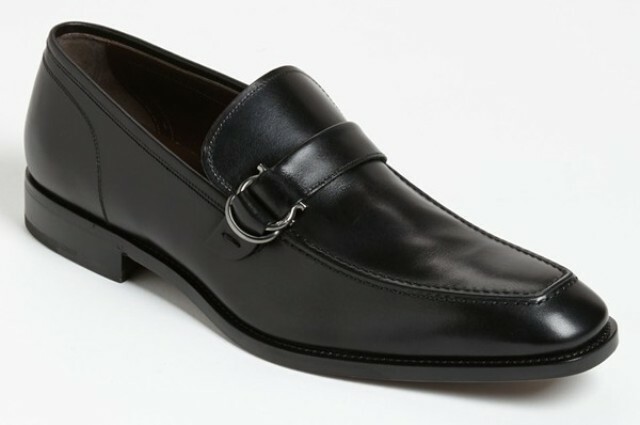 How to wear this black penny loafer for men? Tip: – My first choice will be chino pants, opt for slim fit chinos, make sure they have no pleats on the front. All colors of chinos will match with this black loafer. You can then complement your trend with a dress shirt and a black blazer to match with the shoes. 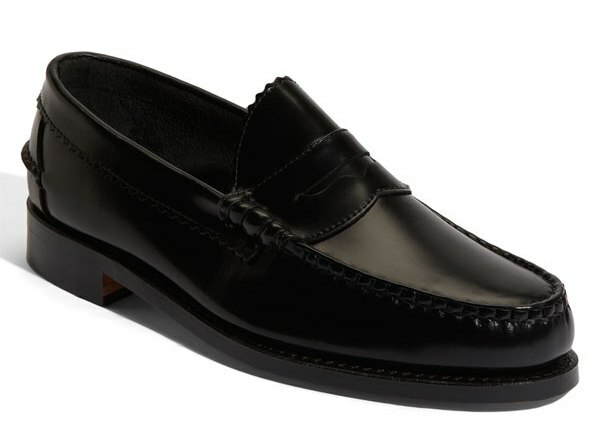 Tip 2:- Formal work jeans will also match with this black loafer. Wear straight leg simple flash denim jeans because they have a straight fit style, so the jeans will sit on top of the loafer, creating more space for the loafer to get its own attention. You can wear a dress shirt or plaid shirt with your jeans, but complement the shoes with a black leather belt. If you want to add value to your trend, you can opt for a black blazer. I’m a great fan of suede shoes, this brown suede Terry’ Tassel Loafer has a trendy style which will make you look fashionable if you complement it well. This penny loafer features suede upper, leather lining and a rubber sole. It has this eye-catching design which will make you look fashionable. What to wear with these brown suede penny loafers? Tip 1: If you want to wear them to work, you can team them with khaki pants or chinos, complement the trend with a plaid shirt or stripped dress shirt and a round neck sweater. Make sure you wear a belt which matches well with these suede penny loafers. I guess a brown suede belt will look good. Tip 2:- Wear denim blue straight leg jeans with this suede loafer. To look fashionable, you can fold the bottom of the jeans just above the ankle, then where a classy plaid shirt to complement the denim jeans. 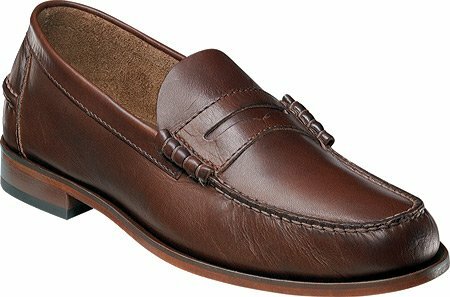 Some fashion trends will rock for years, this Kenwood’ Penny Loafer has been on fashion for a while, since i was a kid, i could see my father wearing these shoes, and they never fade or wore out. You can team these Kenwood’ Penny Loafers with any thing, because they have both a formal and casual style. They feature leather upper, soft leather lining which makes them comfortable and a rubber sole which is durable. The slip-on style makes them easy to wear any time. So, what can you wear with these Kenwood’ Penny Loafers? Tip 1:- You can wear these loafers with formal trousers, but the best trousers to opt for are the flat front trousers with no pleats. If you want to look more professional, you can team them with a suit, in this case, all colors of suits will match with this black loafer. 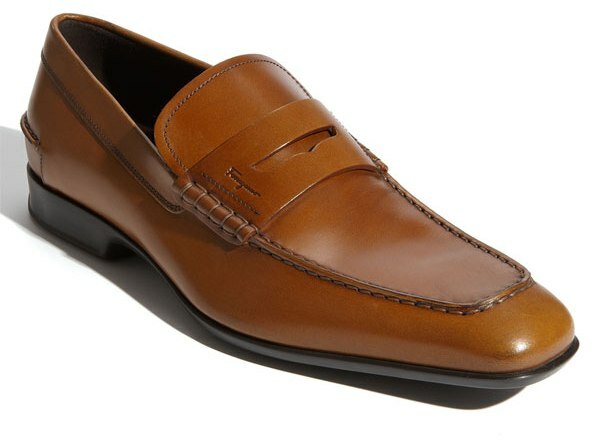 Tip 2: Also khaki and chino pants will match with this Kenwood’ Penny Loafer. To look fashionable, you can complement this trend with a polo collar t-shirt and a black leather belt. Tip 1:- You can team them with jeans. To look fashionable in this style, you can wear straight leg simple denim jeans and polo t-shirt, but fold the bottom of the jeans just above the ankle, don’t wear socks. Tip 2:- If you want to wear them to work, you can team them with khaki pants or chinos, you can then complement the trend with a classy dress shirt or stripped shirt. These are the type of loafers you will wear and feel free the all day. Tip 3:– On weekends, you can team these loafers with shorts. This is a rare fashion style, it is only confident men who can wear loafers with shorts. To look smart, wear a plaid short sleeved shirt with plain khaki shorts, and then tuck in the plaid shirt with your khaki shorts, complement the shoes with a brown leather belt. Yellow is a very rare color when it comes to men’s shoes. But if you team these yellow loafers well, you will look fashionable. They feature smooth yellow leather upper and a moc toe which makes them super unique. You will feel comfortable if you wear these Monroe penny loafers because they have a concealed NIKE AIR® technology on the inside, so you will feel like you have no shoes on your foot. 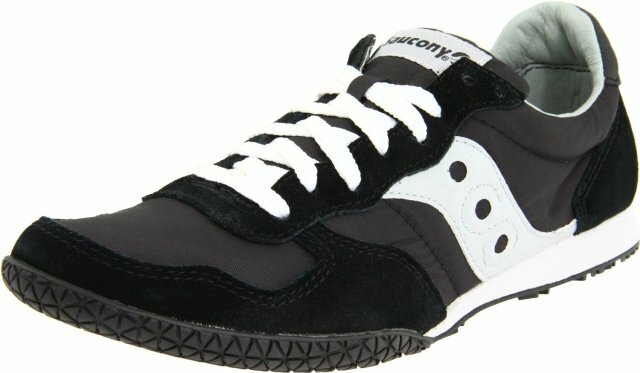 They have leather sole with rubber insert to ensure better traction. These are the best casual loafers every fashionable man should have. 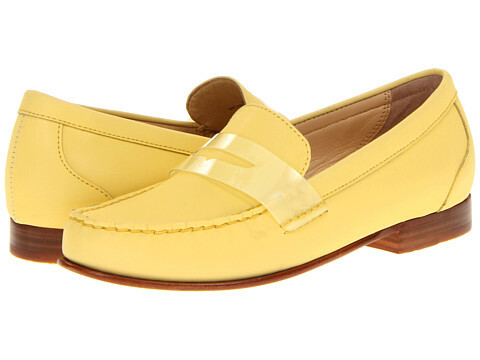 Now, what can you wear with these Yellow Penny Loafers? Tip 1: Since they have a bright color, you can team them with a blue denim jean, and then complement the trend with a white long sleeved shirt. To add value to your style, you can fold the sleeves of the shirt, and then match the loafers with a yellow crafted casual leather belt. Tip 2: Yellow matches with navy blue, so you can team these loafers with a slim fit navy blue chino pant, then complement the chinos with a white and navy-blue stripped shirt. To look casual, you leave the last two – three buttons of your shirt open; also fold the sleeves of the shirt. Tip 3: Color blockers, this is a great loafer for you. You can match it with green chinos, and then complement the green chinos with a white dress shirt and a black blazer. 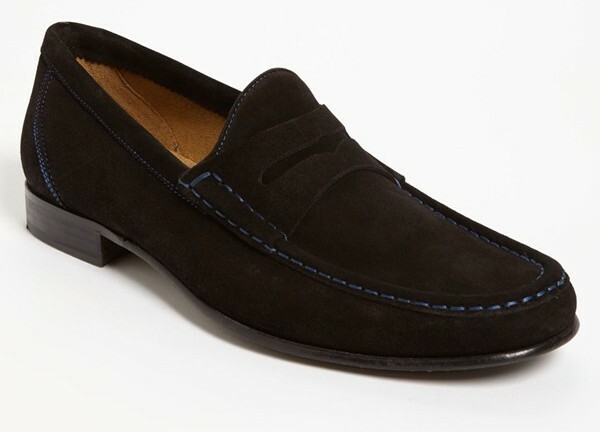 Black suede penny loafers can match with most casual trends because black is a neutral color. This Naper Penny Loafer features black suede upper, leather lining, leather & rubber sole which guarantee durability. I just love the style of these loafers. So what can you wear with these black suede penny loafers. Tip 1: You can wear them with a suit. Hope you have seen fashionable men wearing suits without socks, now this is the type of shoe you can match with a suit without wearing socks. To look stylish, you can wear a two button black slim fit suit, complement the suit with a white check big collar dress shirt, don’t wear a tie with this trend, and simply leave the last three buttons of the shirt open to look stylish. If you want to accessorize, you can opt for black Ray-ban round sunglasses. 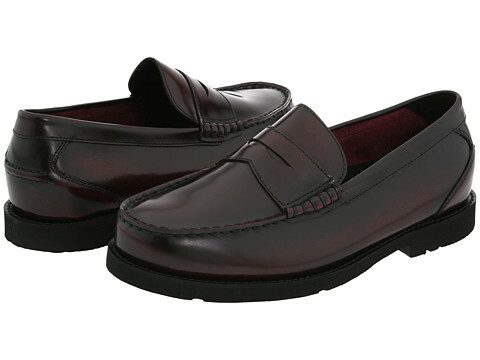 This is a classic career penny loafer which you can wear to work. You can wear it with a gray or navy blue suit because tan brown looks good on those two colors. For men who don’t want to wear suits to work, you can opt for a flat front trouser or chino formal pants. Complement your trend with white or light blue dress shirt and a tan brown leather belt. This Senato’ Penny Loafer features leather upper, leather lining and a rubber sole which make it durable. 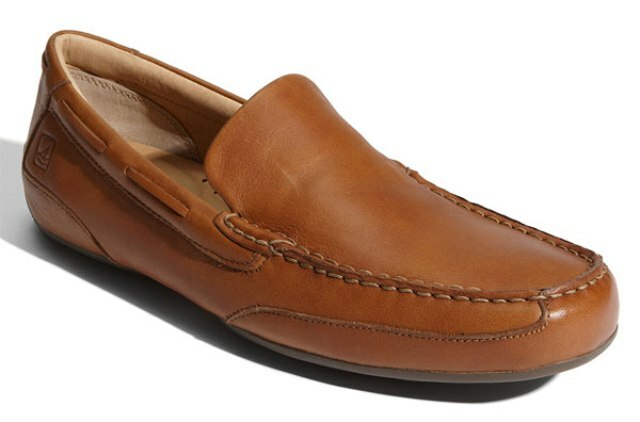 Rockport is well known for making durable long lasting shoes, i once had a Rockport boat shoe, but i just got tired of the shoe and passed it over to my brother, this Rockport Oak Knoll penny loafer comes with the same durability and elegance which will add value to your style and save you lots of cash in the long run. This rockport penny loafer features full-grain leather upper and a rubber sole which makes them durable, they also have an adidas foot-bed which makes them comfortable on the inside. 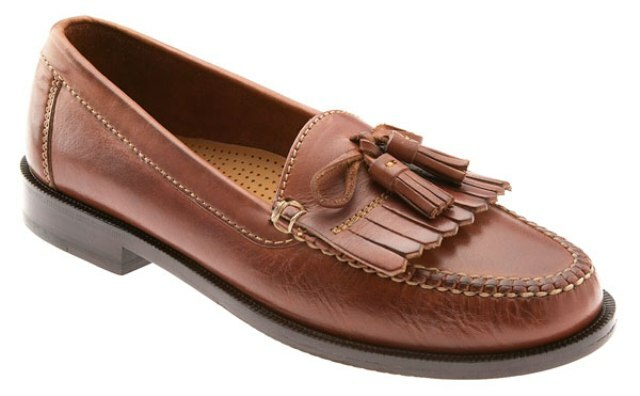 What to wear with this Rockport Oak Knoll Penny Loafer? Tip 1:- Judging from their style, you can wear them with jeans or chino pants. You will not look smart if you wear them with a suit, because the round toe design on the front does not look good with suits. This is a combination of boat shoe style and a penny loafer. It is a casual shoe which you can wear with most casual trends. The shoe features a white rubber sole and leather upper, it also has a comfortable Air cushioned pad on the inside which makes them comfortable and easy to wear. How to style these Authentic Original’ Penny Loafers? Tip 2: Team this brown Authentic Original’ Penny Loafers with khaki or chino pants, however, also denim jeans will look nice on these shoes. Loafers are formal shoes which can be dressed in a casual manner, if you don’t want to wear socks with most of your trends; you should opt for penny loafers. They also differ in style, you can see shoe no: (10) is quite different from shoe no: (9), this small difference will also determine what to wear with that particular penny loafer. In the picture above, you can see men wearing jeans, suits, and chino pants with these loafers.